Neuroscience is the study of the brain and nervous system and involves scientists and technical approaches from many traditional disciplines in the life sciences. 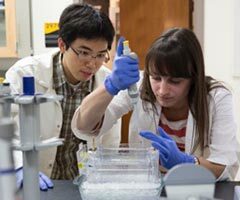 At UWM, neuroscience research and graduate training involves faculty, students, and postdoctoral researchers from several academic departments. UWM neuroscience faculty are engaged in research on several important questions. This work is funded by research grants from the National Institutes of Health and the National Science Foundation as well as several private foundations and the private sector. Multiple approaches and levels of analysis are represented by the various laboratories including behavioral, cellular, cognitive, molecular, and systems neuroscience. 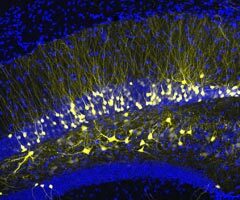 Specific areas of interest include molecular signaling and neural development, hormonal control of behavior and reproduction, and the neurobiology of memory and cognition in humans and laboratory animals. Specific research interests are listed on the individual faculty pages listed on the People page. UWM undergraduates can construct a program of study that takes advantage of the many introductory level and graduate/undergraduate course offerings by our distinguished faculty. Each of the participating laboratories also offer opportunities for independent research and specialized “hands-on” experience with modern techniques. Undergraduate training in neuroscience is intended to prepare the student for graduate study or professional school in the life sciences. Graduate students pursue interdisciplinary coursework and independent research leading to the M.S. or Ph.D. in Biological Sciences or Psychology. Prospective students should apply to either program with the choice of department determined by the student’s specific interests and choice of major professor. Specific admissions requirements and instructions may be obtained elsewhere on this server through the links above. Feel free to contact any of the faculty members listed above using the information provided in their individual profiles or send email to neuroscience@uwm.edu.